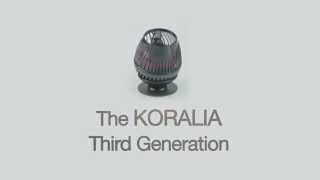 The new Koralia Third Generation is super compact, energy efficient and is ideal to recreate the natural and beneficial water motion of rivers and seas. The patented Dual Magnet Support System (DMSS) allows the user to position the Koralia freely inside the aquarium. The pump can pivot in virtually any direction to guarantee flow where it is needed and is enhanced with vibration absorbing silicone for silent operation. 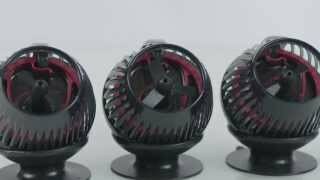 The revolutionary spring impeller technology is designed for optimal flow performance. The new Koralia Third Generation can be connected to a controller and set to intervals from seconds to hours. Two sizes of fish guards, flow diffuser, and cable protector are included. Available in three sizes: 1350gph, 1950gph, 2450gph. Dimensions: 4.5" x 3" x 3.25"
Glass Thickness: up to 3/5"
Hydor has been producing a comprehensive range of equipment for aquariums and ponds since 1984 and offers the best in high-technology for the creation of a living ecosystem at home. 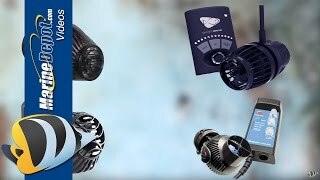 The factory has developed thanks to the engineering competence of its founder and its continuous growth is based on the investment it has made in research and the development of innovative technical appliances. A competitive and dynamic structure of more than 150 employees regularly engages in the implementation of products which meet the demands of 50 nations and keep pace with the evolution of the world markets. The global quality is not a simple working method but a daily expression of mind. Pump easily attaches with magnetic back, no mounting hardware required. Flow is strong upto 1 foot from pump, but than the current weakens to nothing. Small strong pump. Three different attachments make the flow rates disperse differently. Nice add on. Magnetic mount is a plus. Runs super quiet. Low wattage = less heat = happy corals. perfect,powerful and super quiet.I have other Hydor models but I'm replacing them with Gen3. Not sure but time will tell but not been doing reef tanks since 1997 only had it a few weeks sorry not glamorize something I barely had ..